Sending kids back to school means that homework will be coming home -- and sometimes a lot of it! Homework can be frustrating for children, especially if they can't locate the supplies that they need to get started. One of the easiest ways to keep your child on top of his homework is to <a href="http://www.inhabitots.com/8-eco-friendly-organizing-tips-for-back-to-school/">make sure he is organized</a>. This can be tough -- especially with younger children who are just starting to learn the importance of keeping track of their school work. 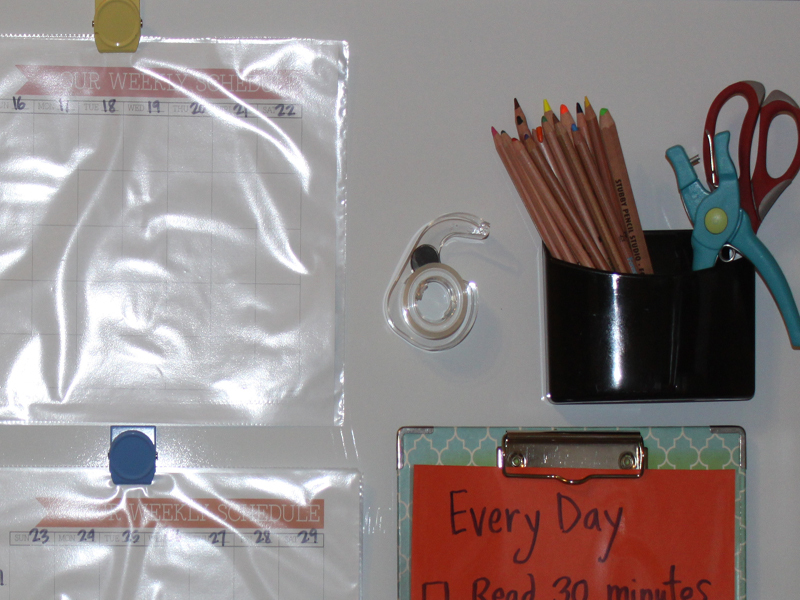 <br><br> A great way to keep your child's homework organized at home is to create a simple homework station. I wanted a homework station that would not only keep my son's homework organized, but that would allow me to see his progress at a glance. I also needed a system that would be easy to use, both for him and myself - because if it is easy to use, he will do it! I spent a few minutes creating a homework station for my son this afternoon, using supplies that I found in my <a href="http://www.inhabitots.com/how-to-set-up-a-home-recycling-center-with-your-kids/">recycling bin</a> and home office. 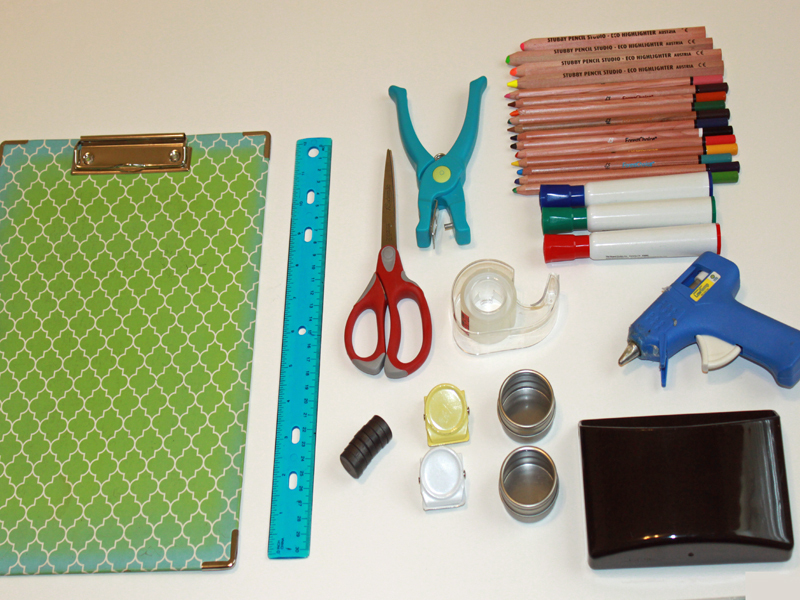 Read on to learn how you can create an eco-friendly homework station for your child. 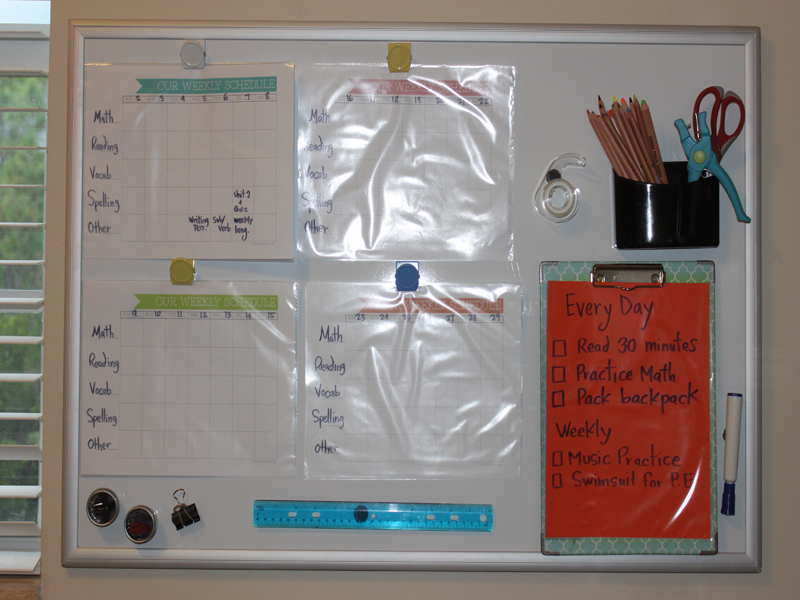 <h2>Step 2: Get Magnetic</h2> The easiest way that I could think of to keep all of the supplies together was by gluing magnets on the back of essential supplies and hanging them on the magnetic board. The supplies that my son uses almost every night include; scissors, tape, hole punch, paper clips, pencils, markers, and a ruler. <h2>Step 3: Make it a Habit</h2> My son has other things that he has to practice everyday to keep up in school. For example, he needs to practice his musical instrument, read for at least 30 minutes and practice his math facts. 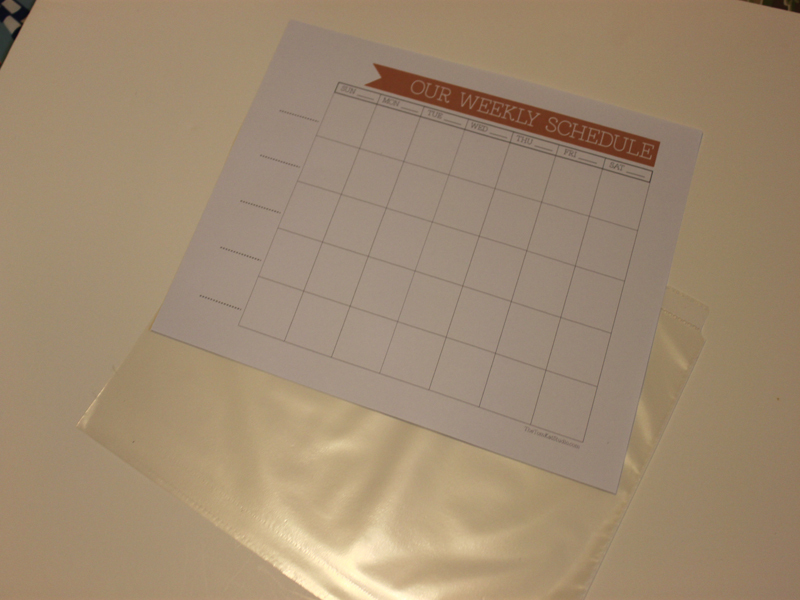 I used a large piece of orange paper that I found in the recycling bin and placed it inside another reusable clear page cover and wrote his daily and weekly reminders on it with a dry erase marker. I included a large check box next to each item, so he can check it off as he completes it. 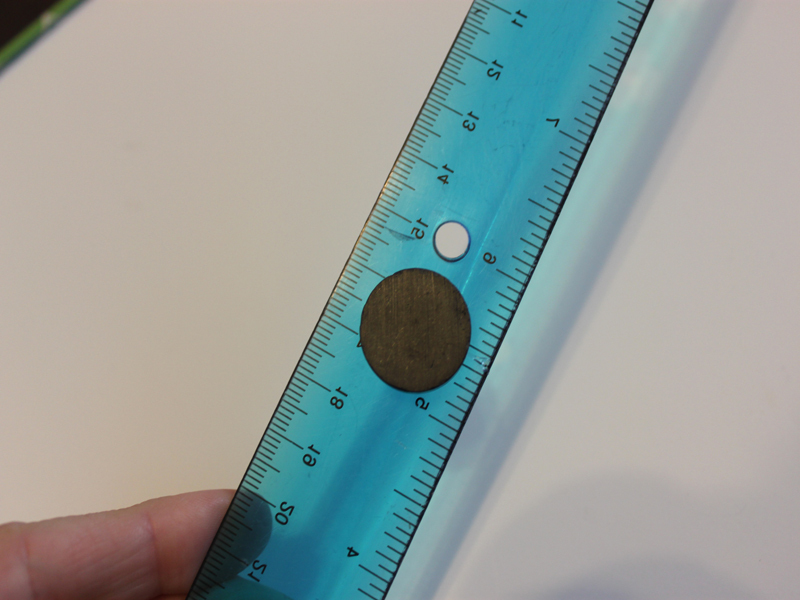 <h2>Step 4: Keep It Together</h2> The key to this system working is to return items to the magnetic board when you are finished using them. The magnets make this system very easy to maintain. 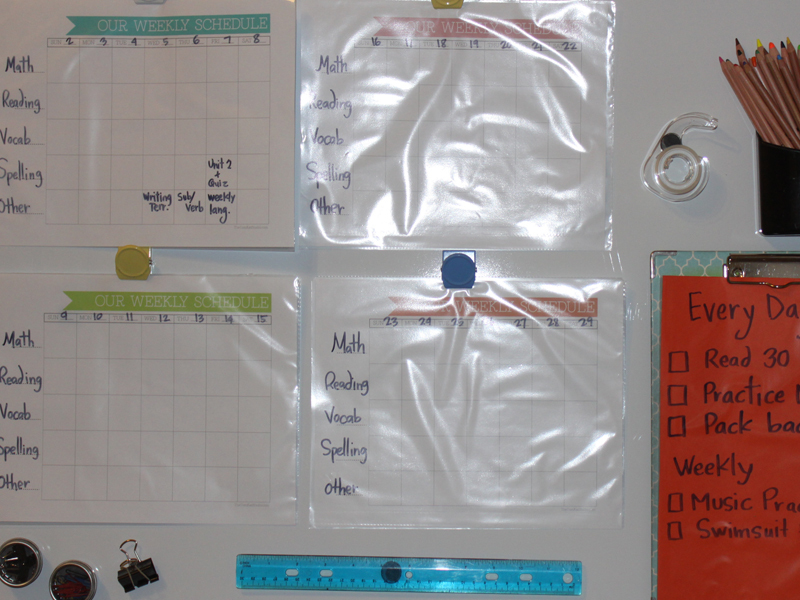 Just gather up the supplies after the homework is finished and place them back on the board. <h2>Step 5: You Have to Use It</h2> In order for the system to work, you have to keep it updated daily. I want my son to take over writing the assignments in the box and marking them off when they are completed. I want him to see that being organized can really help him do well in school. These types of systems also work well for adults - especially those of us who work at home. <h2>Step 6: Make it Fun</h2> Let your child help to create the board and decorate it the way that they like. This will encourage them to take pride and control of the board. 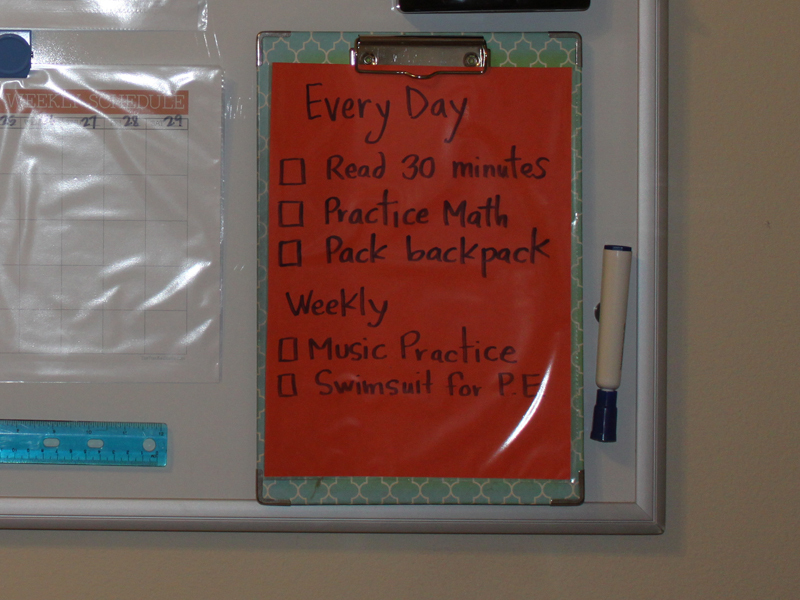 Put the board in a section of your home where everyone can see it, and encourage your child to go in and update the board after they finish their homework each evening. How do you keep your child's homework organized?